At first glance, time seems to have stopped at Bighorn Canyon. The lake and the steep-sided canyons provide a peaceful setting for those seeking a break from the daily routine. 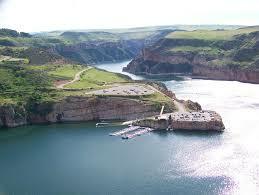 The focus of the area is 71 -mile-long Bighorn Lake, created by Yellowtail Dam near Fort Smith. Dedicated in 1968, the dam provides electric power, water for irrigation, flood control, and recreation. Boating, water skiing, fishing, swimming, and sightseeing are main attractions. While you enjoy the play of light and shadow on rock and water, take time to contemplate the changes that the land and the life upon it have undergone. Time and water are keys to the canyon, where the land has been shaped by moving water since upheavals of the Earth’s crust built the Pryor and Bighorn mountains millions of years ago. For 15 miles upstream from the dam, the lake bisects a massive, arching anticline, exposing fossils that tell of successive times when this land was submerged under a shallow sea, when it was a tropical marsh, and when its conifer forests were inhabited by dinosaurs. Humans arrived here more than 10,000 years ago, living as hunters and gatherers. In modern times people have further altered the land. Most of Bighorn’s visitors come to enjoy the recreational opportunities the lake offers. Boaters, water skiers, anglers and scuba divers are all attracted here. But the park offers more than just the lake: from the wild flowers in spring and summer to more than 200 species of birds; from the stories of life forms adapting to a harsh environment to the modern search for energy. You can get more information on what the park offers at visitor centers near Lovell, WY, and Fort Smith, MT. Find your own place of solitude to relax and to enjoy the diversity and timelessness of this uncommon canyon water land. In North America people have traveled and made their living along rivers and streams for more than 40,000 years. But the Bighorn River was too treacherous and too steep-walled. People here lived near the Bighorn but avoided navigating it—until the dam tamed the river. The broken land here also challenged the ingenuity of early residents, forcing them to devise unusual strategies of survival. More than 10,000 years ago, Indian hunters drove herds of game into land traps. These Indians lived simply, gathering wild roots and seeds to balance and supplement their meat diet. They made clothes of skins, baskets and sandals of plant fibers, and tools of stone, bone, and wood. The many caves of the Bighorn area provided seasonal shelters and storage areas for the Indians, as well as for early traders and trappers. After 1800, explorers, traders, and trappers found their way up the Bighorn River. Charles Larocque met the Crow at the mouth of the Bighorn in 1805; Captain William Clark traveled through a year later. Jim Bridger claimed he had floated through the canyon on a raft. Later fur traders packed their goods overland on the Bad Pass Trail, avoiding the river’s dangers. During the Civil War the Bozeman Trail led to mines in western Montana by crossing the Bighorn River. Open from 1864 to 1868, the trail was bitterly opposed by Sioux and Cheyenne; the Crow were neutral. The Federal Government closed the trail in 1868 after the Fort Laramie Treaty. Fort C.F. Smith, now on private land, guarded the trail as an outpost. A stone monument commemorates the Hayfield Fight, a desperate but successful defense against Sioux and Cheyenne warriors. In this skirmish a party of soldiers and civilian haycutters, working three miles north of Fort C.F. Smith, fought for eight hours until rescued by the fort’s troops on August 1, 1867. After the Civil War, cattle ranching became a way of life. Among the huge open-range cattle ranches was the Mason-Lovell (the ML); some of those buildings remain. Dude ranching, reflected in the remains of Hillsboro, was popular in the early 1900s. The Crow made the transition from hunter-gatherers to ranchers in one generation. In 1904, after 12 years of labor, they completed an irrigation system and opened 35,000 acres of land to irrigated farming. Water was diverted into the Bighorn Canal by a 416-foot diversion dam, moving 720 cubic feet of water per second. Near Afterbay Campground is Bighorn Canal Headgate, remains of this human response to the challenge of the land. 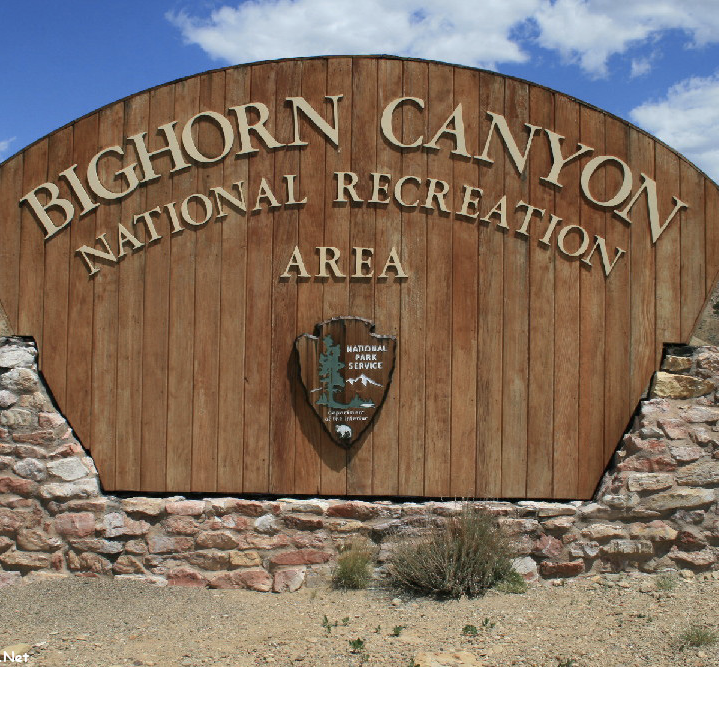 Congress established Bighorn Canyon National Recreation Area in 1966 as part of the National Park System to provide enjoyment for visitors today and to protect the park for future generations. The solar-heated visitor center near Lovell, WY., symbolizes the energy-conscious concerns of the National Park Service and of modern Americans. The heating is accomplished by storing heat from the sun in a rock bin, then blowing hot air through the building. The Yellowtail Dam Visitor Center, in the park, is two miles past the community of Fort Smith. It is approachable from the north by car. The wildlife of the Bighorn Canyon country is as varied as the land, which can be divided into four climate or vegetative zones. In the south is desert shrub land inhabited by wild horses, snakes, and small rodents. Midway is juniper woodland with coyotes, deer, bighorn sheep, beaver, wood rats, and porcupine. Along the flanks of the canyon is pine and fir woodland with mountain lions, bear, elk, and mule deer. In the north is shortgrass prairie, once home to herds of buffalo. Many of the smaller animals, such as cottontails, skunks, coyotes, and rattlesnakes, are seen frequently throughout the park. More than 200 species of birds, including many kinds of water fowl, have been seen here. Each plant and animal species is adapted to the particular conditions of temperature, moisture, and landform within one or more of the park’s four primary zones. Bighorn sheep are a common sight in the canyon. The dam is named in honor of Robert Yellowtail, former Crow tribal chairman and reservation superintendent. The dam creates one of the largest reservoirs on the Missouri River tributary system. This arch type dam is 525 feet high. Riparian, cottonwood forest, shrub land, and wetlands provide habitat for whitetail deer, bald eagles, pelicans, heron, water fowl, wild turkeys, and other species. The area is managed by the Wyoming Game and Fish Department through agreements with the National Park Service, Bureau of Land Management, and Bureau of Reclamation. Mason-Lovell Ranch: A.L. Mason and H.C Lovell built cattle ranch headquarters here in 1883. Cattle roamed the Bighorn Basin in a classic open-range operation. Hillsboro: A one mile round trip trail takes you to the site of Grosvenor William Barry’s Cedarvale Guest Ranch and the 1915 to 1945 Hillsboro post office. Lockhart: Caroline Lockhart, a reporter, editor, and author, began ranching at age 56. The well preserved buildings give a feel for ranch life; one mile roundup. Ewing-Snell: This site was in use for nearly 100 years. American Indians camped along this trail 10,000 years ago, and in prehistoric and historic times Shoshone used it to get to the buffalo plains. Early trappers and traders used it to avoid the dangers of the Bighorn River. You can see rock calms left along the route between Devil Canyon Overlook and Barry’s Landing. Before the arrival of the horse, life changed little here for thousands of years. Small family groups wintered in caves near the canyon bottoms. In early spring they moved out of the canyon bottoms in search of plants and small animals, and in summer they moved to the highlands in search of game and summer maturing plants. Large groups gathered in fall for a communal bison hunt. Here the canyon crosscuts the gray limestone of the Devil Canyon Anticline, a 1,000-foot high segment of the fault blocks that make up the Pryor Mountains. 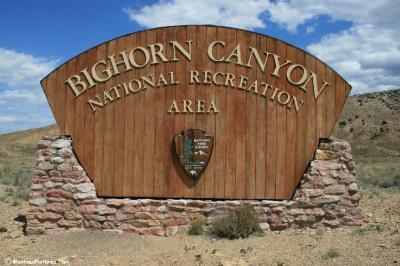 A film at Bighorn Canyon Visitor Center highlights park activities. Exhibits explain the canyon’s history and natural features. Boating enthusiasts will find a marina, snack bar, camp store (gas and oil), and boat ramp at Horseshoe Bend and OkABeh. Ramps are also at Afterbay Dam and Barry’s Landing. All boaters should sign registration sheets at the ramps when entering and leaving the lake. If mechanical problems develop while you are on the lake, stay with your boat; hail other boaters and ask them to notify a ranger. Carry both day and night signaling devices. Do not try to climb the lake’s steep canyon walls. Swimmers are encouraged to use the lifeguarded areas at Horseshoe Bend and Ok-A-Beh. Camping is restricted to designated sites in developed areas. It is also allowed in the back country and below the highwater mark along Bighorn Lake. Fire restrictions during periods of high fire danger may close certain areas to camping. Check with a ranger for the restrictions on fires or back country camping. Hiking is available in the national recreation area and in nearby forests. Ask at the visitor centers for more information. Hunting is allowed in designated areas in accordance with state laws. Trapping is prohibited. Fishing in Montana or Wyoming requires the appropriate state fishing license. Fine game fish, such as brown and rainbow trout, sauger, ling, and perch, abound. The most popular game fish, a gourmet’s delight, is the walleye. Winter ice fishing around Horseshoe Bend is good. The Bighorn River provides excellent brown and rainbow trout fishing. Regulations and Safety: Firearms are prohibited in developed areas and areas of concentrated public use, unless they are unloaded and cased. Pets must be on a leash in developed areas and in areas of concentrated public use. Trash and waste disposals into area waters are prohibited; all vessels must have a waste receptacle on board. Carry a first-aid kit as a precaution against poisonous snake bites. All plants, animals, natural and cultural features, and archeological sites are protected by federal law. Collecting is prohibited.